Eating continues on. I am bracing myself for major food increase. He eats a lot, but not insane amounts. I am still waiting. Sleep has been going well. 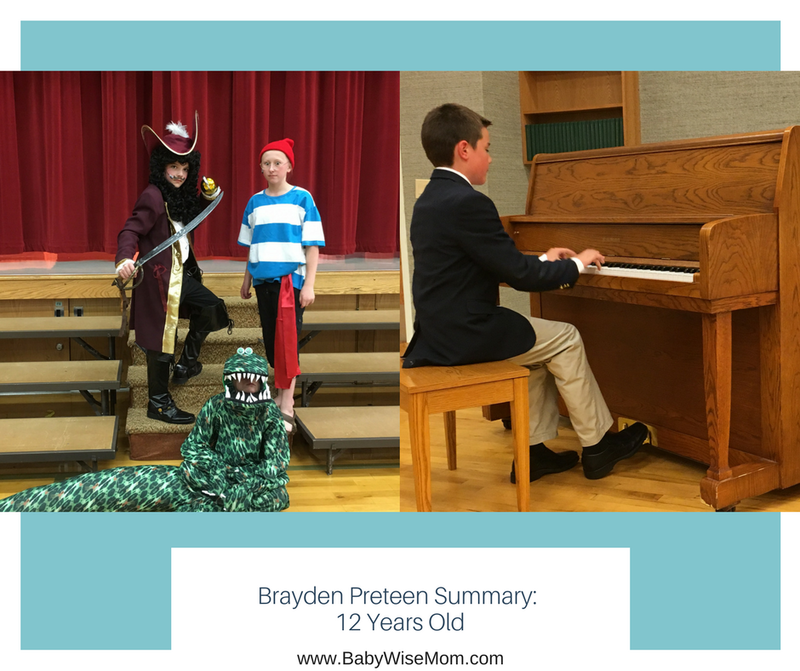 I recently wrote on preteen sleep needs, so if you want to know what preteen needs there, check that out. After Brayden is in bed each night, he is allowed to read. We let him decide when to stop reading and go to sleep. He is good and responsible about it. School is good! He is graduating from elementary (as I write this, it was just today). He is getting ready to move on to Jr. High. He is very excited to move on. Brayden recently got braces. Now I get to stomp around and bemoan the fact that I have two in braces and the difficulties of that financially. No…but really. There has been talk of McKenna going to braces soon, and I recently decided she can wait until Brayden or Kaitlyn is out (I am sure it will be Brayden first). I don’t want to bemoan the financial state of three in braces all at once. There were some fun things going on this time period. We finished up the musical. Brayden was Captain Hook in Peter Pan. It was really his perfect part. He played the character so well. He also finished up basketball and started and finished soccer. He continued on the piano. He really enjoys the piano and has decided to continue taking lessons through the summer this year for the first time. I always give the kids the option (I do start two weeks before school starts just so they can get back in the swing of things before they have to focus on school). Now that Brayden is 12, he is wondering about social media accounts. When can he get one? Many people at school are getting them at 12 (which is pretty old compared to much of the nation). I recently wrote on this topic, and Federal Law protects children only under the age of 13, so at the least, my children will be 13. I still have a year to ponder my full stance more. A little parenting hint, when your child informs you that “everyone” is doing something, ask for a list of “everyone” and return that list with the people you know who don’t fall in that “everyone” list. This is why moms should talk to each other. You can reverse it for the “no one.” So when you hear “Everyone has a smart phone!” or “Everyone has Instagram!” get the list, return your own, and continue on. 4:00 PM–Home. Homework if there is any. Freetime. In the evening, swim team and any other sports he is playing also happen.